What Pickups for my G-5120?? I bought a G-5120 when they first came out. I love the Guitar but not the Pickups so much. I'm thinkin gof upgrading the Pickups. What would you all recommend. I have a G-6128 George Harrison Duo Jet with Dyna Sonics & want a different Sound.. If you want the classic Gretsch filtertron twang, you can't go wrong with a set of TV Jones Classics. If you don't want to drop in that much money, I believe you can get a set of Gretsch Filtertrons on eBay pretty cheap. You might need some ring risers to help raise the pickup towards the strings - if I recall correctly it is because the 5120's have a steeper neck angle than the 6120. What's in it now? I can't remember which pickups those came with. Never mind. Looks like Gretsch buckers. Adjusted like this, they sound great. Three full turns in that configuration. They can sound really good adjusted up like this. I have gotten many compliments on the tone of this guitar. I should at least try adjusting the Pickups. Is there a Pic at a better angle so I can see, approximately, how high you've adjusted them on each String on each Pickup? I dropped Fralin P90s into my 5120 and couldn’t be happier. It’s a nasty orange beast. Not the typical choice, but man does it sound awesome to me. They transformed my Country Gent. In the configuration shown. The bridge pickup, three full turns out of the three screws on the low side and at the upper(6,5,4) strings and then three full turns out of the three screws on the high side near the lower(3,2,1). 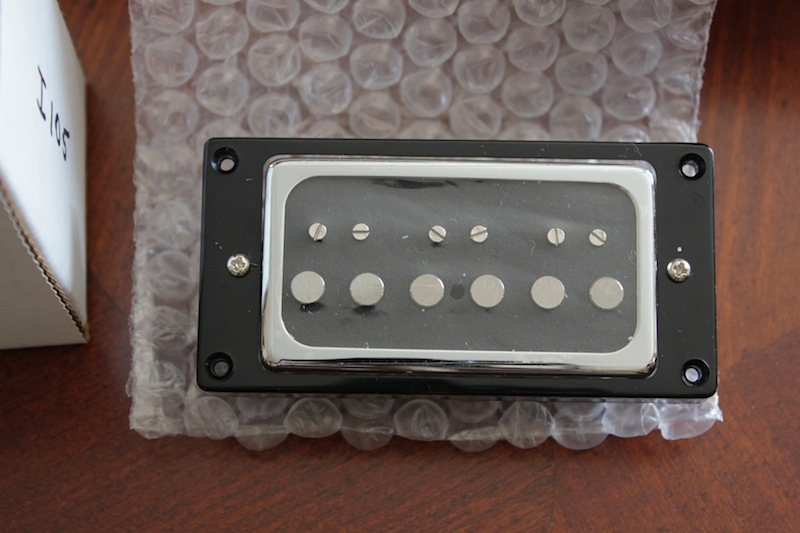 Just try it out on the bridge pickup first and see what results you may get. I'm betting you'll be surprised. I was and I really have been complimented on the tone of this guitar since I did this. If you don't like it, you can always turn them back in or yank the pickups out and put something else in. Aaaahh, I see it now..
Did you do the same thing on the Neck Pickup? I did that and those G-Buckers don't sound half bad. I followed your instructions & it does sound much better.. It actually sounds like a different Guitar.. I'll have to play them for a few days & decide what to do. I may just keep it as is..
To me, it just keeps it in the realm of authentic and saves you money at the same time. Having another color in the box of crayons is never a bad thing. They do have their own sound and response and work great with Rock. I have actually used the Double cut Jet on more songs on my current project than any other guitar. The Falcon with the filtertrons on others and recently my wife's G5420T Blue on one song. It just keeps things more interesting and you wouldn't want five guitars that all sound the same, right? I'm glad it's worked out for you. Gretsch pickups have their own character and sound as do their guitars. I have learned that BlackTop-FilterTrons need to be up high and Gretschbuckers need to be adjusted as above. 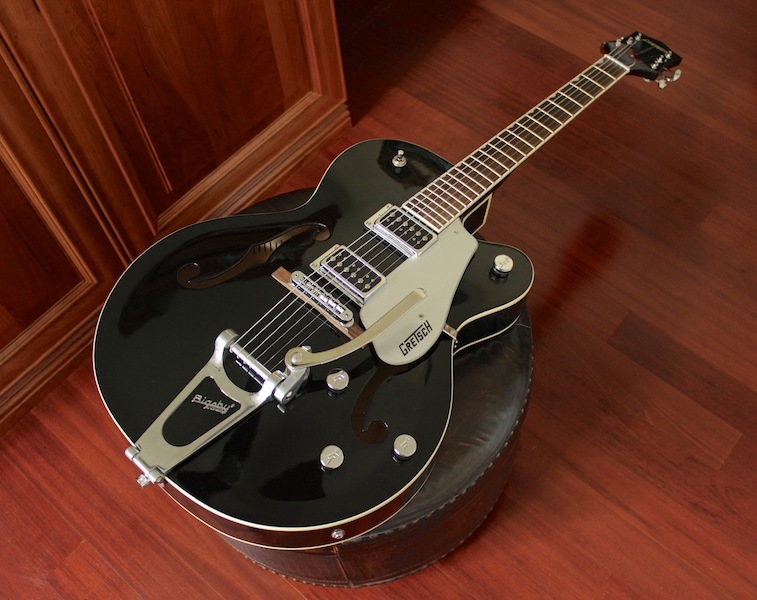 I can't take away from the fact that TVJones makes some very sweet pickups for Gretsch and may also be an option. Many users here are big fans, as am I. It all depends on what you're looking for. I put GFS Surf 90's in my 5120. I like 'em quite a bit. They're a LOT better than the stock G-Buckers, IMO.. The Gretschbuckers were just way too muddy for me. My G-5120 is one of the 1st Generation. I bought when they first came out. I think their Pickups are different than the new Series of G-5420's & the other Electromatics. Since I have the GH Duo Sonic with Filter Trons I'd want a different sounding Pickup if I make a change. TVJ Classics or Filter Trons.. The question always comes down to, Does it make sense to spend as much money as the Guitar cost to Mod it? Knowing I'll never get it out of it if I sell it.. In the long run does it make sense? If it takes it from just another guitar in the stable to a first-rank, can't-wait-to-play-it instrument, it's worth doing. Great guitars come at all price points, and some are born great while others have greatness modded into them. You can pay top dollar for a premium piece that, while retaining resale value, doesn't really light you up. On the other hand, you can luck into a bargain guitar that punches far above its class. Money can't reliably buy greatness in a guitar. So it really doesn't matter what the guitar ends up costing - what matters is how you bond with the final result. Over the years, the ones you pay too much for and the ones you paid too little for will at least average out. I've frequently modded a guitar from a back-bencher to first rank. I don't regret that upgrade cost one bit. I've also modded and still failed to make a guitar as wonderful as I'd hoped. In those cases, I take the expensive hardware out, put the stock bits back, and sell. Then I can put the pulls in another guitar - or sell them and get their market value. It's a little more work, but it seems worth it. Its a great looking Guitar & seems to be very well crafted. I figure it would cost about $450 for the Classic or Filter Tron Pickups & install. If it would sound like a 6120 it would be worth it..
My first Gretsch was a Ltd Edition 5120, deep wine red and I put on a TV classic neck and a classic plus bridge,a new TV harness with all the pots ,switches etc,used 10-46 strings and had a improved bridge on it and wow it was a killer, I sold it and bought a 6119 and live to regret selling it.Amazing action,great sounds with the TVs.Jazz,a rock,killer twang and its acoustic sound brilliant. Yes! Each guitar is it's own entity. There is a skill to figuring out what each guitar needs to make it stellar whether it be a pickups, pots, hardware or just a killer setup. My most expensive guitar is my Duo Jet. I changed the bridge to an aluminum Tru-Arc Serpentune, replaced the nut, installed 1 meg pots and flipped the pickups 180 degrees so the poles face inside instead of outside. Sometimes I can't believe I had the huevos to mod such an expensive guitar but now I think it's about as close to perfect for me as it can be. One of my least expensive guitars is a 50th Anniversary Epiphone Casino I found used on Craig's List. The only mods I did to this were to add a shim under the bridge pickup, install a bone nut and put some clear nail polish on the retaining wire on the tuneomatic bridge. I had a 5120 and I installed some HS Filtertrons in it. The guy I sold it to asked if I could reinstall the Gretschbuckers because that is the sound he fell for when he played it. Everyone is on their own journey. My G5120 has a set of TV Classics. Highly recommended.